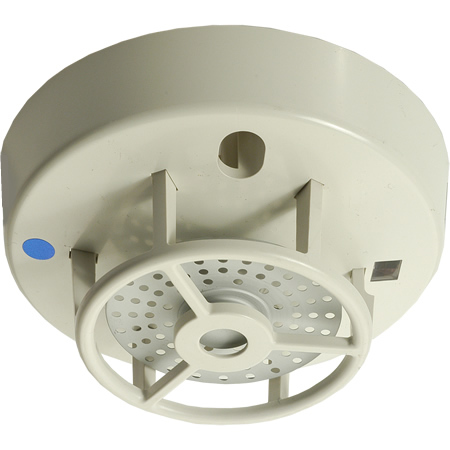 Model DFG-60BLKJ is a 60 C Fixed Temperature Waterproof Heat Detector, the detector uses a bi-metallic strip to sense temperature change, therefore consuming minimal standby current and providing high reliability. The DFG-60BLKJ is particularly suited to environments, which are exposed to high levels of condensation or are hosed down. The detector has a wide operating margin allowing it to respond to both slow and fast increases in temperature; it can also sense temperature reliably in a horizontal or vertical position. The DFG-60BLKJ requires no mounting base as short flying leads are provided for connection to the conventional zone and remote LED. If a back box is required, then the DFG-60BLKJ can be mounted using the Hochiki MBB-1 Marine Approved back Box.